Usually my “lessons” are about products that you should avoid. Not this time! As much as I love having y coffee black (no, that’s not sarcasm) sometimes I like to have a little cream in it. However, calories and fat from coffee cream add up quickly: one tablespoon of 18% coffee cream will add 25 calories, 2.5 g of fat (1.5 g of which are saturated). It will also provide you with sodium and cholesterol. 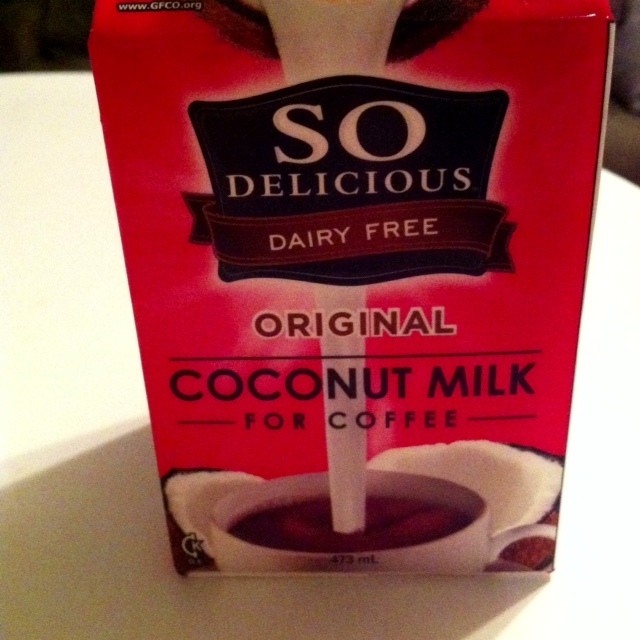 Enter: So Delicious’s Coconut Milk for Coffee. This coconut milk has only 5 calories per tablespoon, 0.3 g fat (0.2 of which are saturated). No sodium. No Cholesterol. Of course, purists won’t be thrilled as along with the main ingredient of coconut milk, there’s cane syrup, colour, dibasic potassium phosphate, carrageenan, and guar gum (although it is organic). Despite these ingredients, I think that this product is a great alternative to regular creams for coffee lovers looking to save calories but not wanting to drink their coffee with low-fat milk or nothing added. Tags: calories, coconut milk for coffee, coffee, coffee cream | Permalink.